Canucks Season Preview Series: Can Coach Coach? Alain Vigneault enters this season as the fifth-longest tenured coach in the NHL. His 328 games with the Canucks ranks just behind Lindy Ruff (984 games coached with Buffalo), Barry Trotz (902 games with Nashville), Randy Carlyle (410 games with Anaheim) and Mike Babcock (410 games with Detroit). In his first 4 seasons as Canucks coach, Vigneault has coached the team to a 182-114-32 record – a 0.604 points percentage – and three Northwest Division titles. He took them to the playoffs three times, and each time, they made it to the second round. In 2006/2007, Vigneault’s first season with the Canucks, the team won games primarily by preventing goals than scoring them. They ranked in the bottom-third in the league in goals scored and powerplay percentage, and ranked in the top-10 in goals against and the penalty-kill. Their commitment to defense – and Roberto Luongo’s goaltending – got them to the second round of the playoffs before they lost to the eventual Stanley Cup champions, the Anaheim Ducks. In 2007/2008, the Canucks once again struggled to score goals. In fact, they finished with less goals than they did in the previous season, and in the process failed to make the postseason. Vigneault faced a lot of questions during the summer that followed. There were rumblings among the fanbase – us included – that he couldn’t coach Brad Pitt and George Clooney to score. 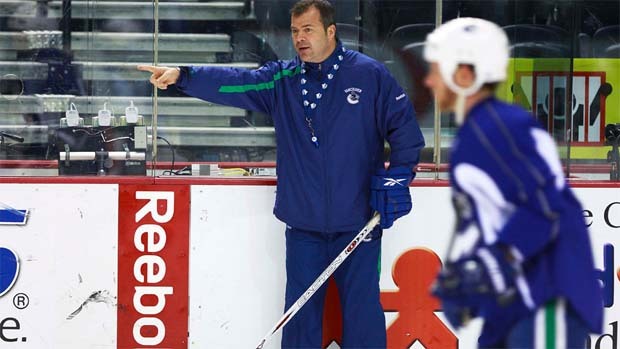 When the Canucks fired GM Dave Nonis and replaced him with Mike Gillis, most of us assumed that Vigneault was as good as gone as well. As we know, Gillis kept Vigneault – he’s even extended his contract twice since – and the Canucks, built with players with speed and skill, are now one of the highest-scoring teams and most exciting teams in the NHL. But for all of Vigneault’s success, he still has to take a team past the second round of the playoffs. In 3+ seasons as Habs coach, his team made the playoffs once and was eliminated from the second round. In his only season as coach of the AHL Manitoba Moose, they were eliminated in the second round. And now, in 4 seasons with the Canucks, he has yet to take them to the Conference Finals. On paper, the Canucks will be icing, arguably, their best, most well-rounded roster in years. Perhaps ever. There’s little doubt they have the personnel to contend for the Stanley Cup; the question remains if the coach can maximize their potential and take them there. J.J.: A couple of years ago, I wondered if AV had what it took to coach a more offensive system; I think it’s obvious now that he can. One thing I noticed last season is that the Canucks played great when they were able to dictate the game’s tempo. (Well, most teams are/should be.) For whatever reason, they weren’t able to do that against Chicago. If they want to get deeper into the playoffs, Vigneault – and his entire coaching staff – have to be able to make better adjustments during and in between games. Katie: I’m the first to admit that I’m not the biggest AV fan, mostly because I’m not fond of his defensive-style coaching. I also believe it was Luongo that won him the Jack Adams (a few years ago); if Luongo hadn’t had the season he did, no way would AV won. Yes his team has made it to the playoffs almost every season AV has coached, but I still think it was the team that got themselves there, and will continue to do so. So does AV have what it takes to get the team past the second round? No, but our team does. Cam from Canucks Army: There seemed to be some serious tactical errors in defense in their second round loss to Chicago. And their PK just killed them. So if AV can fix those problems, then he should succeed this year. Whoever controlled the PK and defense coaching last season (BOWNESS!) should have been fired. That’s the bigger problem. I’d say this season should be AV’s last to prove he can coach in the NHL. Yes, he’s changed his style from the boring defensive approach to a much more uptempo and offensive oriented game, but the fact remains he’s been out coached when it mattered the most – in the play-offs. Ironically Babcock was a defense only coach in Anaheim and made adjustments to his style. Without those changes he doesn’t become the coach he is (Stanley Cup and Olympic Gold Medal winner). That being said, some of the responsibility falls on the shoulders of the players. If they don’t execute – no matter how great the system, it is doomed to fail. And he has had to deal with some major injuries the last couple of seasons and was forced to put players in situations they weren’t capable of or able to rise to.